Great West Virginia Hike Books! There is a small parking area on Smoke Hole Road on the right-hand side with room for about 5-6 cars. There is space for about 3-4 cars on the side of the road just in front of the Radio Tower gate, do not block the gate. 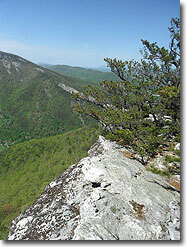 Hikers describe the North Fork Mountain Trail (NFMT) as having "relentless views". They are correct, there are so many overlooks we couldn't mark them all on our hike map. If you want a view, walk no more than 25 yards to the west off the trail and you will find one! We were amazed by this trail and the different types of woodlands, many of them needing fires in order to grow, see this link from The Nature Conservancy for more information. The lack of water on this trail has always been a concern for hikers. However, a post by Zach F. on the WV Highlands Conservancy site proved very useful in finding a spring at the trail midpoint. If you hike this trail, please post a review with an update on how much water is in the spring. This will help fellow hikers track how reliable the spring is over time. The NFMT at 24.7 miles long, is a point to point shuttle backpack best hiked South to North. At the bottom of this write up we also list several shorter alternatives if you don't have time to do the whole trail. Plan to allow about 35 minutes each way for the car shuttle. Mile 0.0 – At the South Trail Head, walk around the gate towards the back of the radio building and tower. To your left you will see a discernible trail, this is the North Fork Mountain (Trail 501) and you will very quickly see blue blazes. Eventually there will be blue diamond markers on the trees for the majority of the trail. There is a short climb to the top of the trail. Mile 0.5 – Reach the first of many overlooks on your left and to the west. The majority of views on the hike will be to the west. Mile 1.0 – Overlook, the next 2 miles are a gentle walk in the woods. Mile 3.2 – Overlook, unique campsite just after this overlook and before the power lines. Mile 3.4 – Power lines, views to the east and west. 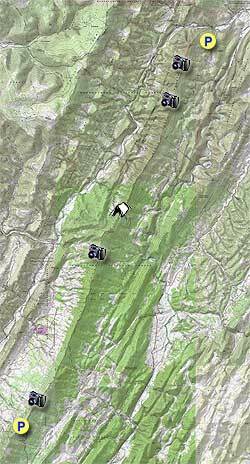 Mile 8.4 – Spur Trail to see Seneca Rocks. 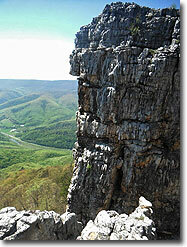 Don't miss this, it's a great view of the backside of Seneca Rocks off in the distance. Mile 10.4 – Flat Tower on left and beginning of FR79, bear to right on fire road. From here to the first nights campsite at mile 12.4 was the least enjoyable part of the hike due to it being on a fire road. Mile 10.8 – Radio Tower, road bears to the left behind tower. Reach first curve on FR79, but continue down road past pipeline crossing. Mile 12.4 – Campsite for night one. To right of campsite is a grass fire road, go about 100 steps downhill, look for square stone, go left about 30 steps to spring. Spring water amount note: 1. May 10, 2014 – 12”, 2. Summer 2013 – flowing. Be prepared to carry enough water in the event the Spring is dry. You could also cache water near this intersection. Day 2 - Hike begins at the brown "Trail 501" sign. There is evidence of fire from the campsite along the next 2 miles of the trail. 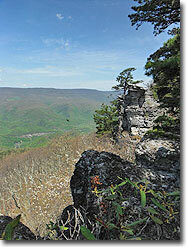 Mile 16.5 – Intersection of Redman Run Trail, just after the intersection is a campsite with an incredible view. As you climb you will soon walk through a Rhododendron thicket, look for cairns on the left for the overlook at mile 18. Mile 21.6 – Spur trail to Chimney Top, stay straight for this out and back. The NFMT turns sharply to the right but go straight on the unmarked spur trail, you can see Chimney Top from here. Mile 21.8 – Chimney Top, great views. There is another way back to the NFMT, a very steep spur trail to the right of a fire ring. This is very steep, so use caution descending. Mile 22.2 – Intersection of steep spur trail to Chimney Top on left. Mile 24.7 – North Trail Head Parking, end of hike. 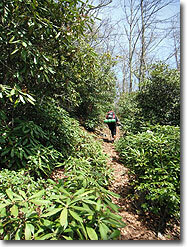 Redman Run Trail up to NFMT and over to North Trail Head parking, 9.6 miles, shuttle hike. Landis Trail Head up to NFMT and over to North Trail Head parking, 5.4 miles, shuttle hike or you could do as an out and back to Chimney Top. North Trail Head parking up to Chimney top and back, about 7 miles round trip. Fire Road 79, drive car to campsite as mentioned at mile 12.4, sketchy road, good clearance needed on this road, camp the night and do the remaining 12 or so miles on Day 2, shuttle hike. Great overnight to the 12,4 mile campsite from the south end where the remainder of the trail was closed due to fire. Even after one of the driest of summers and falls, the spring still contains ample water. We gathered it and filtered for particulates and drank through a filter and it was a lifesaver. Does anyone have the gps coordinates and/or detailed directions to the spring discussed. 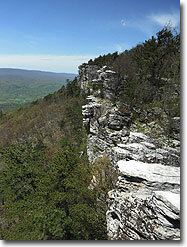 I've never through hiked North Fork, but have done several day hikes around Table and Chimney Rocks. I like the idea of a spring mid way on the complete hike, but have not been able to find Zach F.'s post. Fabulous hike, my second, my hiking partners first. Great weather and views. Shuttled in water to flat tower, used the jugs to refill at the spring, half a gallon for the 3rd day. Just a warning...saw a 4 and half foot rattlesnake at flat tower and it crawled back under the rock imbetween the two front tower platforms....I'm assuming it has a den there...lol...he gave us plenty of warning. Definitely will be a regular hike for me! Great hike with lots of great views. I saw 4 large rattlesnakes on the trail. Also found numerous ticks on me. The well had plenty of water. I purified 10 liters of water for my party. However, the spring wasn't flowing. Someone stole an external light bar from the truck in the north parking lot. That's a big turnoff for this hike. I don't know if I can trust that someone won't cause hundreds of dollars in damage. The intersection of Landis and north fork is poorly labeled. They both have blue markers and the trail signs are a bit twisted. A friend and I day hiked the entire trail. It was a great hike! Tons of views. Took us 8 hrs of walking time and 1.5 hrs for lunch and stops. Checked the spring at the half way point and water was flowing pretty well. Definitely could have filtered some if we needed water. The above instructions were spot on and made it impossible to get lost.